The USeIT Poster Presentation at the Games, Learning, and Society Conference for 2008 went exceptionally well. Many visitors came by to see the work that students and teachers were doing in Squeak as part of the NSF-funded project. There seemed to be a great interest in the results of the project to date and curiosity about how Squeak will be utilized in the high schools next year. Students’ work was a hit! Off to Games, Learning and Society Conference 2008! Well, I fly out Wednesday, headed to Madison, Wisconsin for the 2008 Games, Learning, and Society Conference. 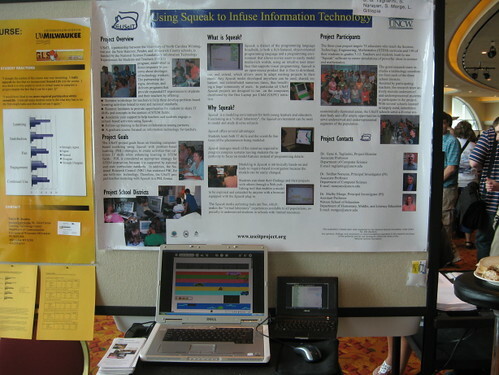 I was awared an educator’s scholarship to attend this year’s conference but will also be presenting our work with Squeak (http://www.useitproject.org) in the Poster Session at the conference.